Have you ever seen error messages like this “Cannot play back the file. The video format is not supported.”? I guess something similar has ever happened to you if you often hang out with videos. When you throw a video, maybe shoot by your new camera or downloaded online, into your iPhone or other gadgets with full of expectation but are told to unable to play it, you must be disappointed and need a solution urgently. Lucky for you, there’s a nice way. 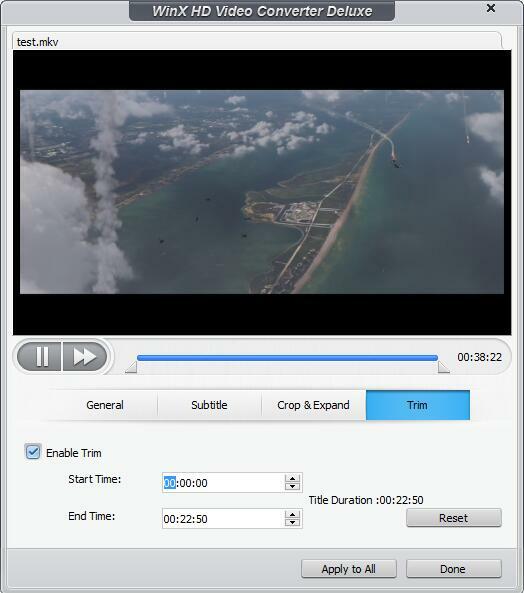 WinX HD Video Converter Deluxe can help convert videos in virtually any format and resolution to fit for computers, TVs, tablets, smartphones, game consoles, online websites, editing software, media player and others, at lightning conversion speed without sacrificing quality. Better still, it is given away, originally $49.95, on the occasion of its developer Digiarty Software 11th Anniversary Celebration. Both PC and Mac users around the world can download a licensed copy for free through June 6. Moreover, an iPhone file manager – WinX MediaTrans is offered as a bonus gift. What Features Does WinX HD Video Converter Deluxe Come with? This is an all-in-one video converter beating most similar programs in terms of compatible inputs, outputs, speed, quality and others. Next, we’ll review its main features one by one. There’re lots of video formats, common or obscure. Surprisingly, this converter embedded with 370+ video and audio codecs can read and convert almost all of them, such as MP4, AVI, WMV, MKV, MOV, AVCHD, MTS, MPEG, MOD, TOD, HEVC, DAT, DAV, and MXF. With the development of technology, we can get close to 4K UHD and even 8K videos. Meanwhile, this tool keeps up to date with the trends, allowing users to convert and compress those ultra HD videos without hassle. Output format of well-known HandBrake is limited to MP4 and MKV only, which makes many user needs can’t be met. However, WinX video converter is much different. Besides MP4 and MKV, it provides AVI, WMV, HEVC/H.265, MOV, MPEG2, FLV, WebM, MP3, AAC, FLAC and so on. It is worth noting that this ongoing software is a top-notch HEVC/H.265 video converter capable of converting videos from/to HEVC – a new video compression standard. Nowadays, people often spend more leisure time on portable devices than on clumsy computer. They chat with friends, surf the internet, and play videos via portable devices. Built-in 410+ output profiles make it easy to convert videos to fit for your device. You don’t need to set aspect ratio, video resolution and other video audio parameters. Just select one profile based on your device model, and then you will get a resulting file perfectly compatible with your gadget. This converter covers optimized profiles for Apple iPhone, iPad, iPod, Apple TV, Android Samsung, HTC, Huawei, Google, Amazon, Sony, Microsoft Windows Phone, etc. Video editing isn’t always the privilege for skilled users. Beginners can do that as well, with this use-friendly converter. Just perform simple clicks, and then you can merge multiple video clips into a single one, trim off unwanted footage, crop away letterbox, etc. Transcoding speed and output quality matter most when we choose a video converter. This one we put here will never disappoint you. Making full use of advanced Intel QSV, MMX-SSE, Nvidia CUDA/NVENC, Hyper-threading, and AMD 3DNow! Tech, it works faster than most products of its kind. Designed with High Quality Engine and “Yadif Double Frames” De-interlacing Engine, it enhances video and audio quality efficiently. Besides working as a video converter, it is also bundled with other two useful features. It is able to free download videos and music from YouTube and other 300+ media-hosting sites, and create photo slideshow videos with customized background music. Its Mac variant can even record videos on/before the screen. If you’re looking for an easy-to-use and professional video converter, WinX HD Video Converter Deluxe is second to none. It comes with straightforward interface, supports a wide range of inputs and outputs, delivers high-quality resulting file quickly, and offers necessary options for both rookies and advanced users. Digiarty develops it as shareware, but distributes licensed copies with full features at $0 before June 6, 2017 to celebrate 11th anniversary. Time is limited. Fewer and fewer copies are left. Act now to free get a video converter. Digiarty Software is a world-leading provider of personal and home-use DVD video software based on Windows and macOS. After 11 years of hard work, it has rolled out a series of full-fledged and easy-to-follow programs, including DVD ripper, DVD copy software, DVD burner, HD video converter, online video downloader, media player, iPhone file manager, video audio streaming app, etc. Their products are highly acclaimed by users and editors from popular technology sites like TechRadar, CNET, PC Advisor, How-To Geek and Lifehacker. And their development and research never stops.